Whether it is excessive sun, harsh weather, or poor diet, skin is constantly under attack and requires special attention. 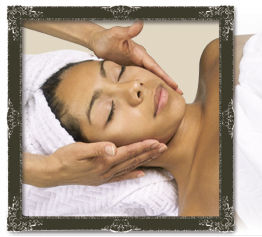 Improve the health of your skin with a professional face treatment. After a thorough skin analysis to determine your skin type, a treatment is customized for maximum effectiveness. After a thorough cleanse, skin is professionally exfoliated to remove dead skin cells, followed by massage to increase muscle tone. A customized masque using unique serums is applied to improve skin texture. Your skin is then moisturized to protect against the environment. For the latest in vitamin repair and hydroxy acid exfoliation, our most popular treatment is ideal for premature aging skin. Every step delivers potent, skin-repairing vitamins to noticeably improve skin elasticity, tone and texture. Highly concentrated vitamin C used in combination with a warm mask of pure paraffin will dramatically stimulate collagen production while hydrating the skin. For acne-prone conditions this treatment purifies the skin, targets blemishes and reduces the sebum that can clog follicles. Extractions are included. The penetrating heat of basalt stones are used to massage the face, neck, hands & feet to increase blood flow, reduce muscle tension and bring about balance and healing. This specialized treatment will promote early habits for great skin care and hygiene.